Does the £200/$250 Samsung Galaxy Tab 2 7.0 tickle your fancy? It's been a busy time on the Android planetoid this week with plenty of handsets and tablets making their way through the TechRadar office. The flood of Android tablets in 2011 has dried up considerably since the iPad failed to do anything other than #win, but we've seen a couple of good ones of late. The Galaxy Tab 2 7.0 is the latest to receive the TR hand model treatment and offers a decent experience at a great price, so we'll be interested to see how it performs. 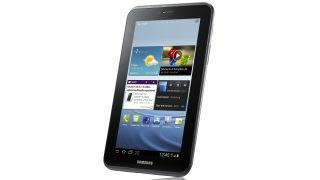 Samsung has fought hard to make the Galaxy Tab 2 7.0 compete as a strong rival to both the Amazon Kindle Fire and Apple iPad based on size, price and features. Android 4.0 is a great operating system, which makes a tablet like this easy to recommend, and has helped Samsung build a strong contender in what could be a hotly contested space. That doesn't mean we're going to let it off the hook, however. The disappointing screen, unrefined TouchWiz experience and dull response to your finger make this a contender, but not a champion. For those who strive for the best experience, the sharpest screen and the most slender, curvaceous build will see that Samsung has cut corners. It has kept costs down to offer something affordable to recession-hit customers, and still make a margin for itself, and to be honest, we don't blame it one bit. Although not the most high-end handset in the current Sony Xperia range of smartphones, the Sony Xperia P is a phone that punches above its weight and continues to impress with every new turn taken and new feature used. Closer in terms of abilities and performance to the Xperia S as opposed to the Xperia U, the Xperia P is a well-priced Android smartphone that offers considerably more bang for your buck than you can rightly expect from a device with a pay-as-you-go price tag in the region of £340 in the UK or $490 in the US. Add to this the inbuilt NFC capabilities - a feature that is to become increasingly prominent in the near future - and the Sony Xperia P quickly marks itself out as a standout performer that is bridging the expectations and blurring the boundaries of mid and high-end handsets. The Panasonic Eluga is a lower to mid-range Android smartphone dressed in upper to mid-range clothing. It tries hard to go toe-to-toe with the likes of the HTC One S and the Sony Xperia S, but essentially comes up short on most, if not all, fronts. Whether this is due to the slightly dated and slightly unnecessarily tweaked software, the slightly underwhelming processor powering the proceedings, or the slightly odd hardware exclusions (front facing camera, flash, microSD slot) we're not sure. Ultimately, the Panasonic Eluga's slick design and impressive display are not enough to distract from its obvious shortcomings. It's a case of "must try harder" for Panasonic on this occasion. Let's hope that the Panasonic Eluga Power, the next handset set to land from the company, rights some wrongs. Often accused of being ahead of its time, Chrome OS is a fascinating and increasingly functional model and it is likely that anyone that buys a new Chromebook with their eyes open to its limitations will be getting a bargain. The gear itself is an interesting mix of low-cost but well balanced – and the already fine keyboard and touchpad changes have raised Samsung's offering up from so-so to genuinely pleasurable to use. You just can't shake the feeling that this is a huge step in the right direction from Google as it looks to take on the big boys of Apple and Microsoft – and the odds on a success have fallen markedly for this particular underdog. As a simple to use camera with a wide angle lens, Full HD video and a large touchscreen, the Panasonic Lumix FX80 ticks many boxes. However, less than perfect image quality makes the camera suitable for those who value features over image quality and don't want manual control over images. At times it feels like the camera would be better if it had physical controls instead of a touchscreen. However, for undemanding users who don't want manual control, aren't concerned with ultimate image quality and enjoy using a touchscreen, the Panasonic Lumix FX80 could fit the bill.